This dish was sumptuous, rich, delicious and filling. The cooking process, though mostly hands off, filled the house with the the most tantalizing smell all day. The short ribs were falling off the bone (in fact, I had a hard time moving them from the casserole to the serving dish to get a picture without losing the bone entirely!). The meat and vegetables were melt-in your mouth tender and the polenta soaked up the flavorful sauce and nicely offset the bold flavors of the ribs. My only real problem with the dish was that it was a bit monochromatic, but a few quick snips of a green onion would have solved that problem. Season short ribs with salt and freshly cracked black pepper to taste. In a large bowl, combine beef stock, red wine, fresh sage leaves, garlic cloves, 2 tsps. canola oil, and salt and freshly cracked black pepper to taste. Whisk ingredients together thoroughly and place ribs and marinade in a large zip lock bag. Marinate ingredients a minimum of a few hours, but preferably overnight. Seven hours prior to serving, preheat oven to 250° F.
Combine flour, paprika, garlic salt and freshly cracked black pepper, to taste. Set aside. 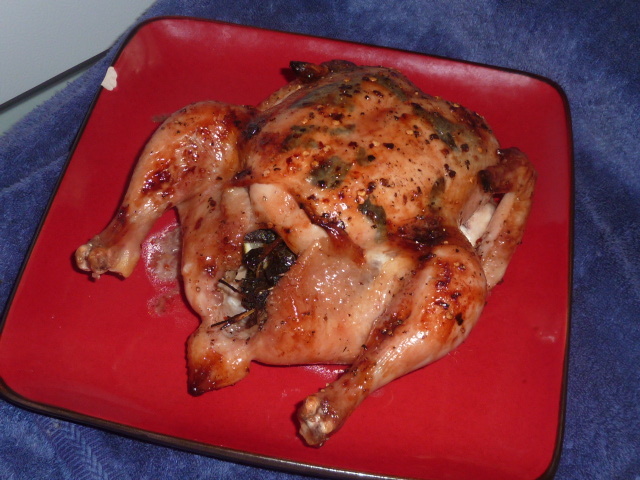 Remove ribs from the marinade, reserving marinade, including sage leaves and garlic cloves. Lightly dredge ribs in flour mixture. In large skillet, heat 1-2 tsps. canola oil over medium-high heat. When oil is hot, add short ribs, being sure not to overcrowd. If necessary, cook in batches. Brown ribs on all sides until coating is a deep, golden-brown and lightly crispy. Place browned ribs and reserved marinade in a casserole dish large enough to comfortably house all ribs. Add tomato sauce and chopped tomato and cover very tightly with casserole lid or tinfoil. Place casserole dish in preheated oven and braise, covered, 4-5 hours. After 4-5 hours, add remaining ingredients (onion, carrot, and mushrooms) and braise another hour. Remove casserole dish from oven. Turn oven off. Separate ribs from braising liquid and cover tightly with tinfoil. Return vegetables with small amount of liquid to oven, which will remain warm for a bit. Place braising liquid in a tall container and allow fat to rise to surface. Skim fat from braising liquid and discard. Simmer remaining liquid in a small, uncovered saucepan over medium-high heat to reduce 15-20 minutes. This is a good point to start creamy polenta (recipe follows). 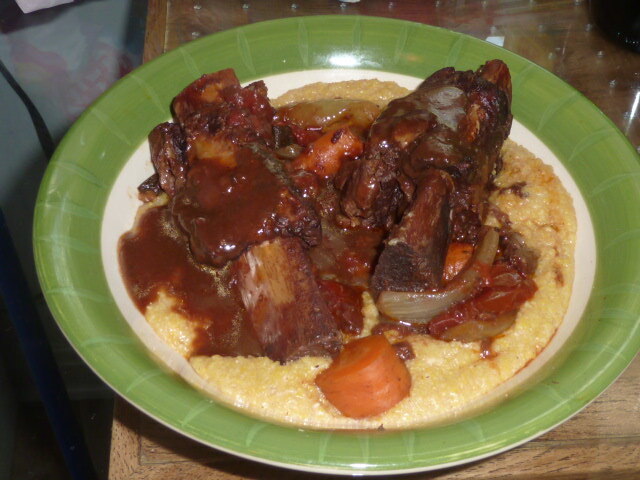 Serve the short ribs and vegetables over creamy polenta topped with reduced sauce. In a large saucepan, bring the stock to a slow simmer. Quickly whisk cornmeal into the stock and continue whisking until slightly thickened. Stir in the yogurt, Parmesan cheese, Brummel & Brown and salt and pepper, to taste. Continue to stir and simmer 10-15 minutes until creamy. Add Tabasco, salt and freshly cracked black pepper.